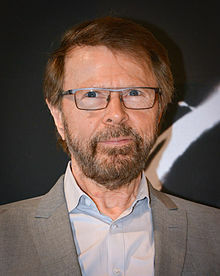 Björn Kristian Ulvaeus (credited as Björn Ulvæus [bjœːɳ ɵlˈveːɵs]; born 25 April 1945) is a Swedish songwriter, producer, a member of the Swedish musical group ABBA, and co-composer of the musicals Chess, Kristina från Duvemåla, and Mamma Mia!. He co-produced the film Mamma Mia! with fellow ABBA member and close friend Benny Andersson. Björn Kristian Ulvaeus was born in Gothenburg on 25 April 1945. In 1951, he moved with his family to Västervik, Kalmar County. His parents were Aina Eliza Viktoria (née Bengtsson; 1909–2005) and Erik Gunnar Ulvaeus (1912–1999). Ulvaeus has one sister, Eva Margareta (born 1948). Ulvaeus studied business and law at Lund University after undertaking his military service, alongside comedian Magnus Holmström. Before gaining international recognition with ABBA, Ulvaeus was a member of the Swedish folk-schlager band Hootenanny Singers, known earlier as the "West Bay Singers", who had an enormous following in Scandinavia. While on the road in southern Sweden in 1966, they encountered the Hep Stars, and Ulvaeus quickly became friends with the group's keyboard player, Benny Andersson. The two musicians shared a passion for songwriting, and each found a composing partner in the other. On meeting again that summer, they composed their first song together: "Isn't It Easy To Say", a song soon to be recorded by Andersson's group. The two continued teaming up for music, helping out each other's bands in the recording studio, and adding guitar or keyboards respectively to the recordings. In 1968, they composed two songs together: "A Flower In My Garden", recorded by Hep Stars, and their first "real" hit "Ljuva Sextiotal", for which Stig Anderson wrote lyrics. The latter, a cabarét-style ironic song about the 1960s, was submitted for the 1969 Swedish heats for the Eurovision Song Contest, but was rejected; it was later recorded by diva Brita Borg. Another hit came in 1969 with "Speleman", also recorded by Hep Stars. While filming a nostalgic schlager special for television in March 1969, Björn met eighteen-year-old future wife and singer-songwriter Agnetha Fältskog. Benny also met his future spouse, 23-year-old jazz and schlager vocalist Anni-Frid Lyngstad, only weeks before. Björn Ulvaeus continued recording and touring with Hootenanny Singers to great acclaim while working as in-house producer at Polar Record Company (headed by future manager Stig Anderson), with Benny as his new partner. The twosome produced records by other artists and continued writing songs together. Polar artist Arne Lamberts Swedish version of "A Flower in My Garden" ("Fröken Blåklint") was one of Björn & Benny's first in-house productions. In December 1969, they recorded the new song "She's My Kind of Girl", which became their first single as a duo. It was released in March 1970, giving them a minor hit in Sweden (and by chance a top-ten hit in Japan two years later). The Hootenanny Singers entered Svensktoppen, the Swedish radio charts, in 1970 with "Omkring Tiggarn Från Luossa", a cover of an old folk-schlager song. It remained on the charts for 52 consecutive weeks, a record which endured until 1990; the song was produced by Björn and Benny, and had Ulvaeus's solo vocal and Benny's piano. After ABBA went on hiatus in 1982, Ulvaeus and Andersson created the musicals Chess, a collaboration with lyricist Tim Rice, Kristina från Duvemåla (based on The Emigrants novels by Swedish writer Vilhelm Moberg), and Mamma Mia! (based on ABBA songs). Together with Andersson, Ulvaeus was nominated for the Drama Desk Award in the category "Outstanding Music" (for the musical Chess), and for a Tony Award in a category "Best Orchestrations" (for the musical Mamma Mia!). The original cast recordings for both musicals were nominated for a Grammy Award. For the 2004 semi-final of the Eurovision Song Contest in Istanbul, thirty years after ABBA had won the 1974 contest in Brighton, UK, Ulvaeus appeared briefly in a special comedy video made for the interval act, entitled "Our Last Video". Each of the four members of the group appeared briefly in cameo roles, as did others such as Cher and Rik Mayall. The video was not included in the official DVD release of the Eurovision Contest, but was issued as a separate DVD release. It was billed as the first time the four had worked together since the group split. In fact, they each filmed their appearances separately. Ulvaeus also shared with Andersson "The Special International Ivor Novello Award" from the British Academy of Songwriters, Composers and Authors, "The Music Export Prize" from the Swedish Ministry of Industry and Trade (2008), and "Lifetime Achievement Award" from the Swedish Music Publishers Association (SMFF). On 15 April 2013, it was officially announced by the EBU and the SVT that Ulvaeus and Andersson, with the Swedish DJ and record producer Avicii, had composed the anthem for the 2013 Eurovision Song Contest. The song was performed for the first time in the Final on 18 May. On 6 July 1971, Ulvaeus married Agnetha Fältskog; the marriage resulted in two children: Linda Elin Ulvaeus (born 23 February 1973), and Peter Christian Ulvaeus (born 4 December 1977). The couple decided to separate in early 1979, and their divorce was finalised in July 1980. Ulvaeus then married music journalist Lena Källersjö on 6 January 1981. This marriage produced two daughters: Emma Eleonora (born 3 January 1982) and Anna Linnea (born 29 April 1986). Ulvaeus and Källersjö currently live in Djursholm, an area of Stockholm. From 1984 to 1990 they lived in the United Kingdom, where Ulvaeus founded an IT business with his brother. He is also one of four people (including Per Gessle) who own NoteHeads, a Swedish company which publishes the music notation program Igor Engraver. In 2008, Ulvaeus said that he suffered from severe long-term memory loss and now no longer remembers many important events in his life. He now has little memory of some of the critical events in his professional history and has resorted to images of his past and even hypnotism to try to bring back his memory. However, in a 2009 interview, he stated that reports of his memory loss were "hugely exaggerated". In a TV interview with Fredrik Skavlan, Ulvaeus said the memory loss pertained to episodic memory. He said that, for instance, he was not nostalgic for his days with ABBA: "It was good while it lasted." The Guardian called him Sweden's "highest-profile cash-free campaigner", explaining that "after his son was robbed several years ago, Ulvaeus became an evangelist for the electronic payment movement, claiming that cash was the primary cause of crime and that 'all activity in the black economy requires cash'". He has reportedly been living cash-free for more than a year, and ABBA The Museum has operated cash-free since it opened in May 2013. The Swedish Tax Agency accused Björn Ulvaeus of failing to pay 90 million kronor (US$12.8 million) in back taxes for eight years ending in 2005. The agency claimed that he "laundered" his music royalty income through institutions in several foreign countries. Ulvaeus paid the taxes as a precautionary measure during the 2½-year dispute. In October 2008, the county administrative court decided the case in Ulvaeus' favour, ruling that he never owed any of the 90 million kronor. ^ "How the first performance by Agnetha, Björn, Benny and Anni-Frid turned into an enormous failure". Mix. February 2011. ^ Paphides, Peter (6 July 2002). "Happily ABBA after". smh.com.au. Retrieved 26 June 2017. ^ Sutcliffe, Libby (5 April 2014). "Abba's Eurovision win in Brighton remembered 40 years on". BBC. ^ "The Government's Music Export Prize for 2008 goes to..." Archived 14 March 2012 at the Wayback Machine. Sweden.gov.se (7 January 2009). Retrieved on 22 July 2013. ^ "Noteheads.com – Corporate". Archived from the original on 28 September 2011. Retrieved 29 April 2008. ^ "Björn Ulvaeus speaks on Humanism". International Humanist. 14 July 2006. Archived from the original on 7 February 2012. Retrieved 3 February 2013. ^ Oscarsson, Marcus (16 July 2008). "Abba star Bjorn's shock admission: 'I'm battling long-term memory loss'". Daily Mail. London. Retrieved 16 July 2008. ^ "Björn: 'Abba will never reunite'". Metro. 2 September 2009. Retrieved 22 July 2013. ^ Skavlan (26 September 2014). Björn Ulvaeus Interview (English Subtitles) | ABBA | Skavlan. Retrieved 7 April 2018. ^ Russell, Helen (12 November 2014). "Welcome to Sweden – the most cash-free society on the planet". The Guardian. ^ Ulvaeus, Björn. "Why we don't accept cash at ABBA the Museum". ABBA the Museum. Retrieved 15 November 2014. ^ "ABBA's Bjorn wins $17m tax case". The Sydney Morning Herald. 15 October 2008. ^ "Sweden's Taxman After ABBA's Ulvaeus Again", E! Online. (4 January 2007). Retrieved on 22 July 2013. ^ "Abba's Björn accused of 87m kronor tax fiddle" Archived 9 March 2009 at the Wayback Machine, The Local, Retrieved on 22 July 2013. ^ "Abba star 'underpaid' Swedish tax". BBC News. 5 January 2007. Retrieved 26 March 2010. ^ Oldham, A, Calder, T & Irvin, C (1995) ABBA: The Name of the Game, Sidgwick & Jackson, p. 226, ISBN 0283062320.